Our face suffers a lot, viz. Pollution, chemicals, harmful rays and lot more. It needs a great cleansing and cleansing wash. 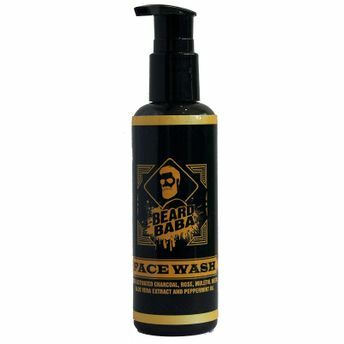 The Beard Baba Activated Charcoal Face Wash works overtime to give you a squeaky clean face. With maximum natural active ingredients like Activated Charcoal, Rose, Licorice Root, Aloe vera, Neem, and Peppermint Oil, that work on different levels, this face wash is a gentle on your skin. This facewash targets deep-down impurities to defend against daily buildup like dirt, oil, pollution and grime for a truly deep cleansing experience. Peppermint Oil balances the production of excessive oils in the skin, thereby reducing overall acne and breakouts. Explore the entire range of Combos @ Nykaa available on Nykaa. Shop more Beard Baba products here.You can browse through the complete world of Beard Baba Combos @ Nykaa .